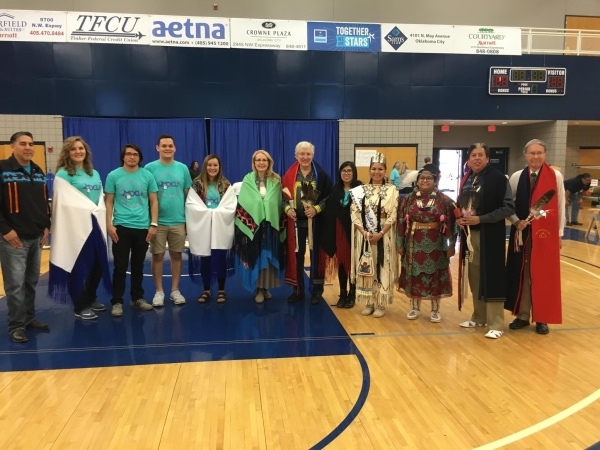 The Native American Society at OKCU hosts a very popular annual contest powwow, Indigenous Peoples Day ceremonies, stickball and hand games, and other cultural events throughout the year. The organization crowns a Miss Indian OKCU each year and also hosts monthly Indian Taco Sales. Native scholars may also participate annually in the Oklahoma Indian Missionary Conference (OIMC), comprised of 89 United Methodist churches in Oklahoma, Kansas and Texas. Our OIMC represents the largest concentration of Native American United Methodists in the United States. The historic Indian Missionary Conference was started by Cherokee, Creek and Choctaw tribes in 1844 and continues today. Find out more ways to get involved at OKCU here!